Take one look around any restaurant and you’ll notice that the majority of the diners are there physically but are not really present. Regardless of the company occupying space at the table, people continue to live their parallel lives in cyberspace using their smartphones and tablets. In a sense you could say that virtual reality is actually quite real for many, even if they are not wearing virtual glasses conversing with a virtual person across the table. Businesses not making use of the fact that people are so highly integrated with computer simulated environments are definitely missing out on a useful tool that is ready for use for more than just entertaining games. Already 20 years ago, research was showing clear signs of our brains being influenced by a new wave of intense exposure to media. In her book Endangered Minds, Jane Healy showed how the constant exposure to television’s alpha waves seriously changed the verbal ability of children and therefore also the ability to learn in a traditional way by reading and listening to a teacher. Today children, and grown-ups, are constantly exposed to those waves through TV, video games, smartphones and tablets. While schools and universities are still busy dealing with a generation of kids unable to grasp traditionally presented learning material, others have already understood what is needed to get the attention of people used to getting everything served through a screen. With virtual reality gaming, one can experience video games like never before. Using glasses like the Oculus Rift and other equipment such as gloves, it is possible to participate in games in a very active way. Video game producers have come up with fantastic solutions for interactive gaming, where players can move around in front of the screen and use their bodies to play the game. One instance of this is in sport games, where the player can make the movements required to move along in the game. Using this new technology, the video games become much more engaging and give the player a sense of enhanced control, adding much to the excitement factor. Actually, it doesn’t even demand glasses or other gear. By simply using 3D graphics the games offer a very real gaming experience. Online casinos are another a great example of the type of business that is willing to use new technologies to better stimulate the minds of its clientele. The casino will have more players hooked on the games using VR glasses or providing 3D graphics and animations to create a real life experience. The true to life gaming experience is exactly what works in a generation that craves immediate gratification and finds it mentally cumbersome to process too many written instructions. There is already a virtual reality cinema that originated in Amsterdam and travels around to let people try stepping into the world of the movie that they are watching. 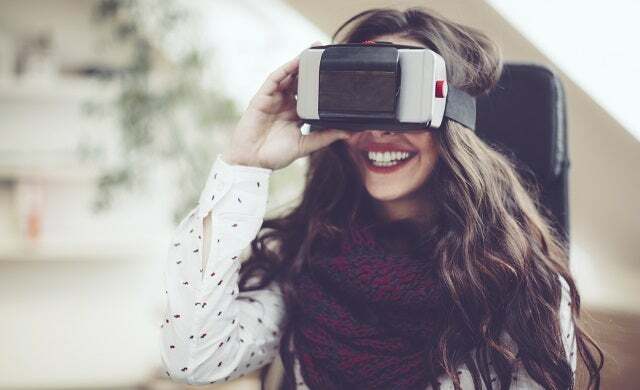 Within the world of entertainment, the concept of VR has come far and it is something that will aid the businesses moving into this sphere for learning and selling purposes. Understanding that the average adult cannot grasp information the same way an adult did 30 years ago is crucial when looking at ways to develop business relationships and in-house training. Today our minds are programmed differently, and they better respond to virtual reality settings than to the traditional written word. Many businesses have a great need for effective learning. New systems need to be integrated quickly and smoothly, and new employees must get into the swing of things at a rapid pace. Where a manual with instructions might have been the way to go a few years ago, virtual reality presents better options today. By using computer simulations that will train people, there is no longer any need for lengthy texts or hiring employees for mentoring purposes. The simulation lets the trainee learn in the most effective way, hands on so to speak. This can be compared to the way pilots train using flight simulators to become truly skilled before they take on the responsibility of actual flights. Of course, pilots need more than simulator training, which is also the case for businesses hiring new staff. But there is no denying that the virtual method of learning can make this process much faster and more effective. For businesses who need their products to reach new clients and new markets, virtual simulation is an amazing tool. Buyers also need easier ways of learning about a new product and will rarely spend much time reading lengthy product descriptions. If they can get an immediate feel for the product or even a service, they are more inclined to buy it. Nowadays, it is possible to create 360 views of products. Potential clients can play around with the product and study it up close before deciding whether or not to invest in it. This technology is easily available and most companies are able to integrate it into already existing presentations online. In fact, many estate agencies are already using the 360 view technology to give virtual tours online for clients looking to buy homes. But isn’t it necessary to provide clients and employees with VR sets in order to make the most of this technology? The more advanced sets can easily cost around £100 and up. In order to get total immersion the set must include everything from visuals and audio to smooth integration with smartphone, computer or console. The advantage of the headsets is that they do offer a true feeling of being in the world presented through the glasses. The most expensive type of VR sets can be of great use for training new employees and perhaps even privately for people who enjoy the stimulation of virtual games. While VR technology can be used without the sets as seen in 3D and 360 view simulations, it doesn’t work as effectively. Sitting in front of a computer twisting a 3D object around is useful but not as powerful as getting “inside” the screen with a pair of glasses. As smartphone companies like Samsung are starting to provide their buyers with free VR sets and the technology is becoming available in public forums like on airlines, it does look like businesses can rely more on their target audience being able to take part of their virtual reality presentations. At some point, if not already, we might start to see free VR sets handed out together with a virtual business presentation letting the potential client step into a different world to try out a product or service. This will indeed be a very powerful way of marketing and also quite possible, considering that most modern smartphones already adapt to VR technology. Virtual reality is not only smart for training and presentations. Today there are plenty of business with staff scattered in different locations. By use of VR technology, meetings become more real as people from different locations can connect in a personal way. This is not only useful for meetings, it can also be used by people working from home. The ability to work from home makes employees happier which has a positive effect on the business. Using the VR headgear you could have the whole staff virtually in your living room! Testing of dangerous materials, products and procedures becomes completely safe using simulation. You are experiencing things virtually so if something goes wrong it only goes wrong in theory and there are no actual negative results. This makes the work environments safer and more pleasant; it also saves time and money on the development and production of new products and services. Are businesses ready for virtual reality? There is no doubt that VR is highly relevant to businesses looking for better ways to expand and promote their products and services, but are businesses ready? It might still take some time to get past the idea of virtual reality being a gaming concept solely meant for entertainment or as a cardboard dream by Google. However, as the new inventions and programs creep into business protocol, people will adapt to it and continue to look for VR solutions in different areas of the company’s activities. Once these points, and more, become tangible, businesses will not be able to afford being unprepared for virtual reality and they will surely make the effort to use this new technology to improve every aspect of their operations.